Ponder the lowly pallet. Assembled of pine, it performs its intended role in the shipping trade admirably. But after a few trips across the country, it is often discarded and ends up being burned or chucked in a landfill. But the people at Windfall Lumber have discovered a better end for old pallets. 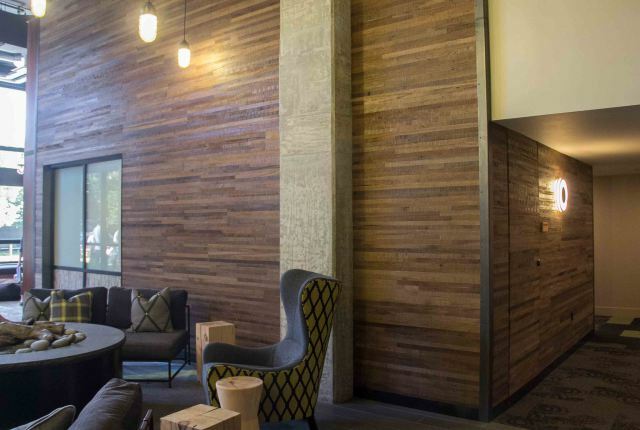 They make the most of the pallet’s banal wood, turning it into panels which get installed as interior siding in lobbies, offices and coffee shops. 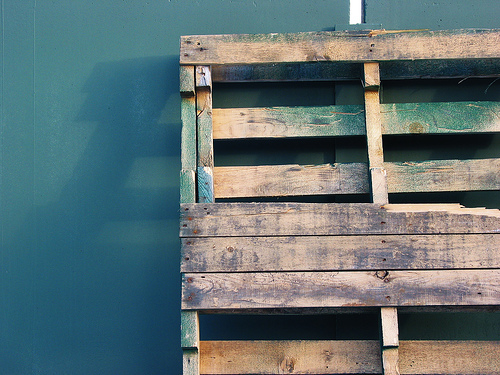 The pallet project is simply the most recent effort by members of our extended American family working at Windfall to redeem what some would see as “trash” into useful products for the building industry. Windfall Lumber is located in Tumwater, just south of the Capitol of Washington State. Founded in 1997 to salvage timber downed in an epic December 1996 ice storm, Windfall Lumber has expanded its “raw materials” to include the aforementioned pallets, power poles prepped but not up to spec, salvaged wood from deconstructed buildings and my favorite, old gym floors. Most of Windfall’s materials are sourced from the Puget Sound region and milled, dried, and finished at Windfall’s Tumwater manufacturing facility. For the first ten years of its existence, Windfall sold most of its reclaimed products for use in homes around the region. But with the housing crash in 2008, Windfall Lumber’s president, Scott Royer, and his team recognized the need to expand the market for their products into commercial and institutional projects. They succeeded and as a result Windfall’s reclaimed wood products can be seen at Clover Park Technical College, South Sound Bank, Vic’s Pizzeria in West Olympia and the Lucky Lunchbox in downtown Olympia. The Lucky Lunchbox sports a Windfall countertop and wall cladding that was a local school’s gym floor before Windfall’s workers got ahold of it. 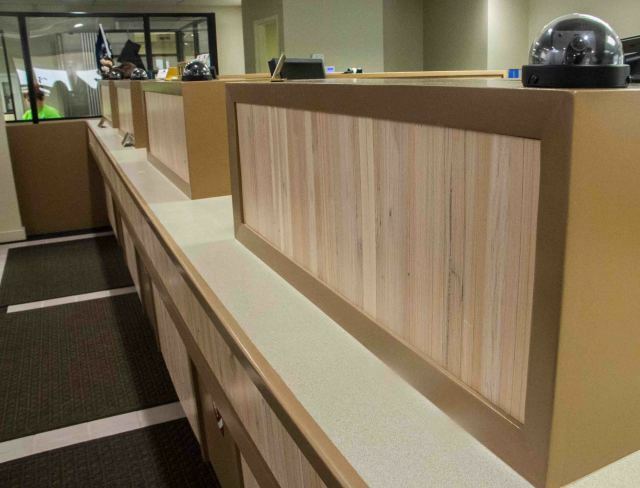 South Sound Bank, Engineered Panel in white. 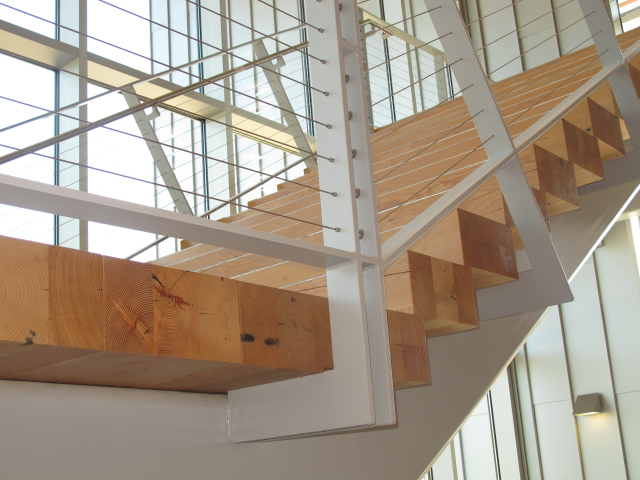 Clover Park Technical College, Library stairs made from beams from previously deconstructed campus building. 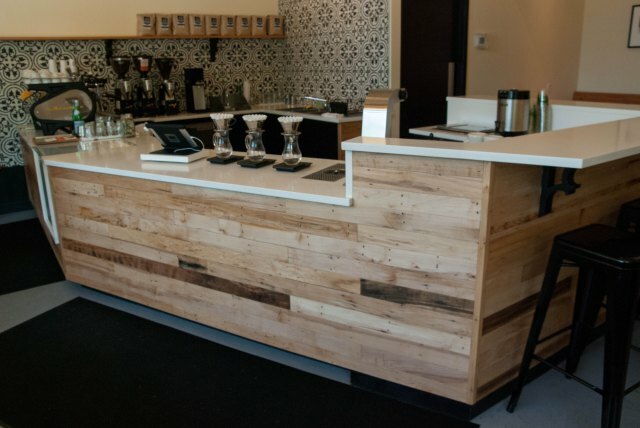 Resurfaced Textile Mill flooring as cladding in Olympia Coffee, Wildwood Center. With the return to health of the building industry over the last four years, Windfall has been expanding its production to supply products for colleges, apartment houses and businesses. This has required Windfall to do quite a bit of hiring to keep up with demand for its products. Windfall’s tagline is “Every piece of wood has a story”. The same can be said for many of its new hires. Windfall has partnered with Labor Ready to provide people to help Windfall hit its production targets. Many of these workers have flourished at Windfall, and have beseeched Royer to come on board full-time. Work is redemptive. It can provide us with the foundation for a new start in life. 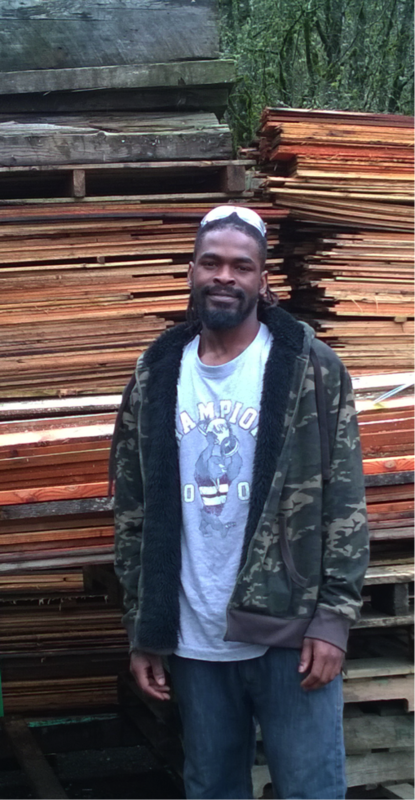 Windfall Lumber’s newest employees have experienced a new start through their work of providing a new life for wood products such as abandoned pallets and power poles. What could be better?